Seed catalogs are a great reminder that the time is ripe to begin planning for your vegetable gardens and landscaping gardens, too. When deciding what to plant, consider not only the beauty, but also the benefits that the flowers and shrubs in your landscaping can provide. They don’t just have to be just sources of joy and color; they can also be important source of pollen, nectar, nesting material, and food for the insects, birds, and caterpillars soon to be butterflies. Your garden doesn’t have to stop a few feet from the ground. 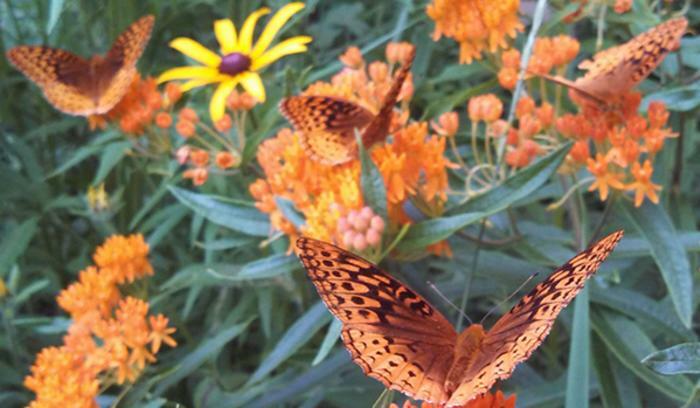 When you plant wildflowers and grasses native to Indiana, your landscaping will fill the space between the earth and the sky with butterflies that flit in to nectar on a flower, birds that swoop in to feast on seeds, and bees that hum their way to the flowers’ pollen. The landscaping around our own home has many of the same native perennial plants that we planted more than ten years ago! The wild columbine, mountain mint, butterfly weed, false sunflower and purple prairie clovers are just as pretty and even more robust than when we planted them all those years ago. Yet, each and every day our landscaping looks quite different depending on what visitors we have in the garden that day: monarch butterflies, swallowtails, goldfinches, fritillaries, bumblebees, and even our own chickens! An important advantage that native plants have over many ornamental plants is that because they are well suited to the local soil and moisture conditions, native plants require less watering and weeding than ornamental plants. One thing to remember is that not all native plants are created equally. The native plants of California are not the native plants of Indiana. Be sure to purchase wildflowers and grasses native to Indiana. Plants native to Indiana are not only well suited to our soil conditions, but they are also in tune with our local native bees, butterflies, and birds. They will grow and bloom at just the right time to be a source of food and shelter for them. Isn’t nature perfect? Many Indiana retailers are now selling local native plants. This wasn’t true just ten years ago, but lucky for us and the native insects and birds, times are a changin’. Many smaller local gardening stores—and even some of the big box stores— are stocking native plants. Be sure to ask at retail shops for natives, even if they don’t carry them now, they might begin to do so if enough people show an interest in purchasing them. Additionally, there is a website dedicated to Indiana Growers who provide Indiana Native Plants for sale. Many of these companies are willing to ship the plants to you. The website is http://growindiananatives.org/buy-native/. So, when planning your landscaping gardens this year, don’t stop with how the ground will look around your house. Lift your gaze and imagine how you can fill your whole yard from ground to cloud with splendor. By planting colorful, native plants that bloom all through the spring, summer and fall, you have the power to fill it all with beauty!